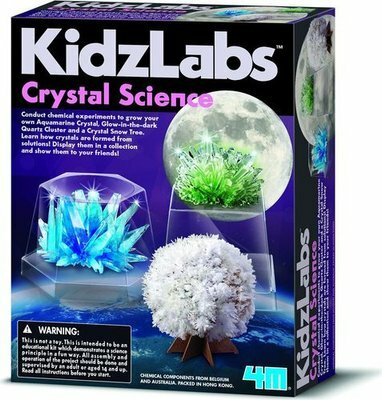 Conduct chemical experiments and create your own set of aquamarine crystal clusters. Glow in the dark crystal clusters and a crystal tree. Display them all to show your friends. Safety Information: Not for children under 3 years. Use under adult supervision • Choking Hazard, small parts. Contains a large bag of white crystal compound* (a base compound called Monoammonium Phosphate), a small bag of blue seeding mixture, a square transparent base with cover, a hexagonal transparent base with cover, a shallow hexagonal container, a glow-in-the-dark moon crystal base, a stirring bowl, a stirring spoon, 1 set of crystal snow tree paper and detailed instructions . Also needed, but not included in this kit: a jar of steaming hot water, an apron, protective goggles, and rubber gloves. The Moon Crystal Cluster will grow to about 45 mm (1.8 inches) in diameter and 35 mm (1.4 inches) in height. The Aquamarine Crystal will grow to about 30 mm (1.2 inches) in diameter and 25 mm (1 inch) in height. The Crystal Snow tree will grow to about 70 mm (2.8 inches) in diameter and 80 mm (3.1 inches) in height. The size, shape, and colour may vary depending on the experimental conditions.